NASA’s Mars Atmosphere and Volatiles Evolution (Maven) spacecraft is seen inside the Payload Hazardous Servicing Facility on Aug. 3. 2013 at the agency’s Kennedy Space Center in Florida. MAVEN will be prepared inside the facility for its scheduled November launch to Mars. As NASA's Curiosity rover celebrates one year on Mars, the space agency has begun final preparations for the launch of its next Red Planet mission later this year. The Mars Atmosphere and Volatile Evolution spacecraft, or MAVEN, arrived at NASA's Kennedy Space Center in Florida on Friday (Aug. 2), just three days before the one-year anniversary of Curiosity's dramatic Mars landing. 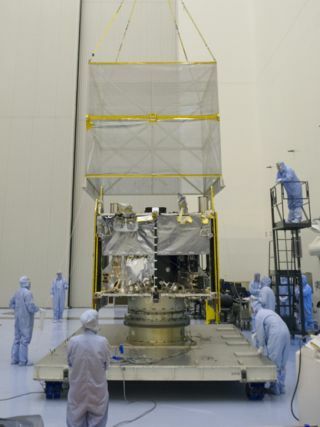 "We're excited and proud to ship the spacecraft right on schedule," David Mitchell, MAVEN project manager at NASA's Goddard Space Flight Center in Greenbelt, Md., said in a statement Monday (Aug. 5). "But more critical milestones lie ahead before we accomplish our mission of collecting science data from Mars. I firmly believe the team is up to the task. Now we begin the final push to launch." Mars has lost most of its atmosphere to space over the eons. The $670 million MAVEN mission, which is slated to arrive in an elliptical orbit around Mars in September 2014, aims to help researchers understand how this happened and what the consquences have been for the planet's ability to support life as we know it. Mission team members hope that observations the spacecraft makes during its one-year prime mission will yield insights about Mars' shift from a relatively warm, wet world in the ancient past to the cold, dry planet it is today. "MAVEN is not going to detect life," mission principal investigator Bruce Jakosky, a planetary scientist at the University of Colorado Boulder, said in a statement. "But it will help us understand the climate history [of Mars], which is the history of its habitability." "It's always a mix of excitement and stress when you ship a spacecraft down to the launch site," Guy Beutelschies, MAVEN program manager at Lockheed Martin, said in a statement. "It's similar to moving your children to college after high school graduation. You're proud of the hard work to get to this point, but you know they still need some help before they're ready to be on their own." Over the next week, engineers at Kennedy will perform a number of tests. For example, they'll check out MAVEN's software and test-deploy the spacecraft's solar panels and booms, NASA officials said. While MAVEN enters the home stretch in its launch preparations, the Curiosity rover is marking a big milestone of its own: one year of exploring the Red Planet. The 1-ton rover touched down on the night of Aug. 5, 2012 U.S. Pacific Time (early morning Aug. 6 EDT and GMT), kicking off a two-year surface mission to determine if Mars could have ever supported microbial life. The six-wheeled Curiosity has already accomplished that goal, determining that a site called Yellowknife Bay was indeed habitable in the ancient past. Curiosity has now embarked on a long trek to the base of Mount Sharp, a mysterious mountain that rises more than 3 miles (5 kilometers) into the Red Planet sky. Curiosity started that journey, which covers about 5 miles (8 km) of straight-line distance, last month. It will probably take the rover about a year to reach Mount Sharp's foothills, mission team members have said.